In March of 2011 Jaime, along with several volunteers, began a two year study of GTMNERR's native bees. 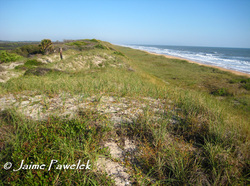 Sites surveyed in year one include the northern managed areas of the GTM including the beach/dunes and peninsula, as well as Matanzas State Forest, and Washington Oaks Gardens State Park in the south. Sites are surveyed once every three weeks on optimal days that are sunny and warm. Sampling for bees is accomplished in two ways; one is considered passive and utilizes pan traps of various colors to attract bees, and the other is more active using nets to collect bees directly from flowers they visit. Typically, small bees are attracted to the pan traps, which are florescent blue, yellow and white. Larger bees are mostly collected with the use of nets, as they are more easily seen by myself and the other bee collectors. Collecting bees from flowers also gives us more information as we record the plants they visit, and now have a record of their preferred floral hosts. This information can then be used when planning habitat gardens to attract bees. 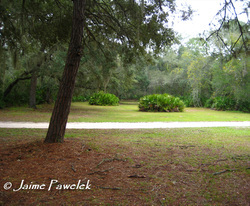 Princess Place Preserve in Flagler County. In 2012, four new sites within the GTM NERR were surveyed so that more area within the reserve would be covered. Sites for year two included the Guana River Wildlife Management Area (WMA) at GTM and the coastal scrub habitat west of A1A. In the south, Moses Creek Conservation Area and Princess Place Preserve were surveyed. The survey also seeks to learn more about how different management practices affect native bee populations. For instance, how does prescribed fire affect ground nesting bee populations? Do areas that manage for timber production provide enough food to support diverse bee populations? Before too many questions can be asked we must first discover what bees live here. A total of 97 species of bees were identified from the GTM NERR (2011-2012). Two dozen bees are still awaiting identification, so it's possible this number may increase slightly. The Guana Peninsula recorded a total of 51 species, which was the highest diversity site in the northern component of the reserve. In the south, the site with the highest diversity was the Matanzas State Forest, with 47 species recorded. A total of 7,437 bees were collected in the 2-year survey from over 70 species of plants, as well as from pan traps.